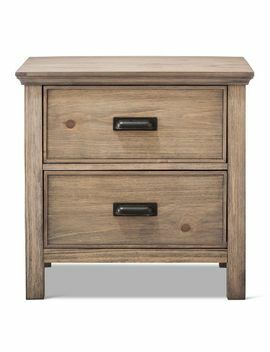 With a clean, modern lines and brass handle pulls, the Gilford 2 Drawer Night Stand from Threshold is what dreams are made of. The sturdy bedside table weighs 35 pounds and can support 50 pounds. Two drawers let you stow your nightgowns in one and journals and lotions in the other. The night stand measures 24.96"Hx25.67"Wx17.09"D.